Okay, maybe the new name isn’t that cool. It sounds like a summer camp for overweight artiodactyls. But whatever. It’s not every day our Solar System gets a new moon. In 2007, the European Southern Observatory (ESO) completed work on the Very Large Telescope (VLT) at the Paranal Observatory in northern Chile. This ground-based telescope is the world’s most advanced optical instrument, consisting of four Unit Telescopes with main mirrors (measuring 8.2 meters in diameter) and four movable 1.8-meter diameter Auxiliary Telescopes. Recently, the VLT was upgraded with a new instrument known as the Multi Unit Spectroscopic Explorer (MUSE), a panoramic integral-field spectrograph that works at visible wavelengths. Thanks to the new adaptive optics mode that this allows for (known as laser tomography) the VLT was able to recently acquire some images of Neptune, star clusters and other astronomical objects with impeccable clarity. In astronomy, adaptive optics refers to a technique where instruments are able to compensate for the blurring effect caused by Earth’s atmosphere, which is a serious issue when it comes to ground-based telescopes. Basically, as light passes through our atmosphere, it becomes distorted and causes distant objects to become blurred (which is why stars appear to twinkle when seen with the naked eye). One solution to this problem is to deploy telescopes into space, where atmospheric disturbance is not an issue. Another is to rely on advanced technology that can artificially correct for the distortions, thus resulting in much clearer images. One such technology is the MUSE instrument, which works with an adaptive optics unit called a GALACSI – a subsystem of the Adaptive Optics Facility (AOF). The instrument allows for two adaptive optics modes – the Wide Field Mode and the Narrow Field Mode. Whereas the former corrects for the effects of atmospheric turbulence up to one km above the telescope over a comparatively wide field of view, the Narrow Field mode uses laser tomography to correct for almost all of the atmospheric turbulence above the telescope to create much sharper images, but over a smaller region of the sky. This consists of four lasers that are fixed to the fourth Unit Telescope (UT4) beaming intense orange light into the sky, simulating sodium atoms high in the atmosphere and creating artificial “Laser Guide Stars”. Light from these artificial stars is then used to determine the turbulence in the atmosphere and calculate corrections, which are then sent to the deformable secondary mirror of the UT4 to correct for the distorted light. Using this Narrow Field Mode, the VLT was able to capture remarkably sharp test images of the planet Neptune, distant star clusters (such as the globular star cluster NGC 6388), and other objects. In so doing, the VLT demonstrated that its UT4 mirror is able to reach the theoretical limit of image sharpness and is no longer limited by the effects of atmospheric distortion. This essentially means that it is now possible for the VLT to capture images from the ground that are sharper than those taken by the Hubble Space Telescope. The results from UT4 will also help engineers to make similar adaptations to the ESO’s Extremely Large Telescope (ELT), which will also rely on laser tomography to conduct its surveys and accomplish its scientific goals. These goals include the study of supermassive black holes (SMBHs) at the centers of distant galaxies, jets from young stars, globular clusters, supernovae, the planets and moons of the Solar System, and extra-solar planets. In short, the use of adaptive optics – as tested and confirmed by the VLT’s MUSE – will allow astronomers to use ground-based telescopes to study the properties of astronomical objects in much greater detail than ever before. In addition, other adaptive optics systems will benefit from work with the Adaptive Optics Facility (AOF) in the coming years. These include the ESO’s GRAAL, a ground layer adaptive optics module that is already being used by the Hawk-I infrared wide-field imager. In a few years, the powerful Enhanced Resolution Imager and Spectrograph (ERIS) instrument will also be added to the VLT. Between these upgrades and the deployment of next-generation space telescopes in the coming years (like the James Webb Space Telescope, which will be deploying in 2021), astronomers expect to bringing a great deal more of the Universe “into focus”. And what they see is sure to help resolve some long-standing mysteries, and will probably create a whole lot more! Compared to the other gas giants, Neptune has far fewer satellites, and most of the system’s mass is concentrated within a single satellite that is believed to have been captured (i.e. Triton). 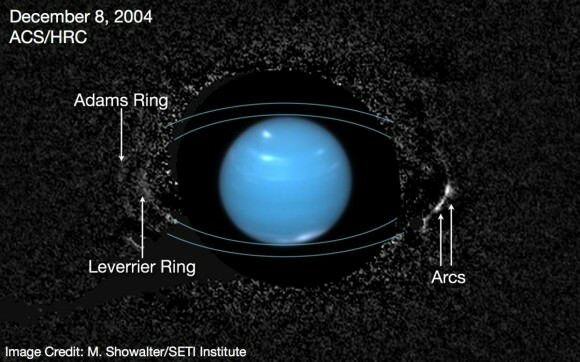 According to a new study by a team from the Weizmann Institute of Science in Israel and the Southwest Research Institute (SwRI) in Boulder, Colorado, Neptune may have once had a more massive systems of satellites, which the arrival of Triton may have disrupted. The study, titled “Triton’s Evolution with a Primordial Neptunian Satellite System“, recently appeared in The Astrophysical Journal. The research team consisted of Raluca Rufu, an astrophysicist and geophysicist from the Weizmann Institute, and Robin M. Canup – the Associate VP of the SwRI. 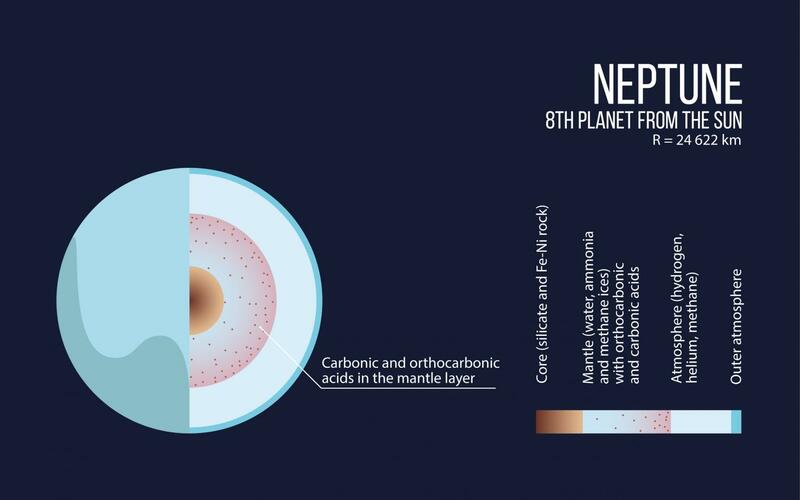 Together, they considered models of a primordial Neptunian system, and how it may have changed thanks to the arrival of Triton. For many years, astronomers have been of the opinion that Triton was once a dwarf planet that was kicked out of the Kuiper Belt and captured by Neptune’s gravity. This is based on its retrograde and highly-inclined orbit (156.885° to Neptune’s equator), which contradicts current models of how gas giants and their satellites form. These models suggest that as giant planets accrete gas, their moons form from a surrounding debris disk. Consistent with the other gas giants, the largest of these satellites would have prograde, regular orbits that are not particularly inclined relative to their planet’s equator (typically less than 1°). In this respect, Triton is believed to have once been part of a binary made up of two Trans-Neptunian Objects (TNOs). When they swung past Neptune, Triton would have been captured by its gravity and gradually fell into its current orbit. To test how the Neptunian system could have evolved, they considered different types of primordial satellite systems. This included one that was consistent with Uranus’ current system, made up of prograde satellites with a similar mass ration as Uranus’ largest moons – Ariel, Umbriel, Titania and Oberon – as well as one that was either more or less massive. They then conducted simulations to determine how Triton’s arrival would have altered these systems. They also found that the interaction of Triton with an earlier satellite system also offers a potential explanation for how its initial orbit could have been decreased fast enough to preserve the orbits of small irregular satellites. These Nereid-like bodies would have otherwise been kicked out of their orbits as tidal forces between Neptune and Triton caused Triton to assume its current orbit. The moons of Uranus and Neptune as imaged during the 2011 opposition season. Credit: Rolf Wahl Olsen. Ultimately, this study not only offers a possible explanation as to why Neptune’s system of satellites differs from those of other gas giants; it also indicates that Neptune’s proximity to the Kuiper Belt is what is responsible. 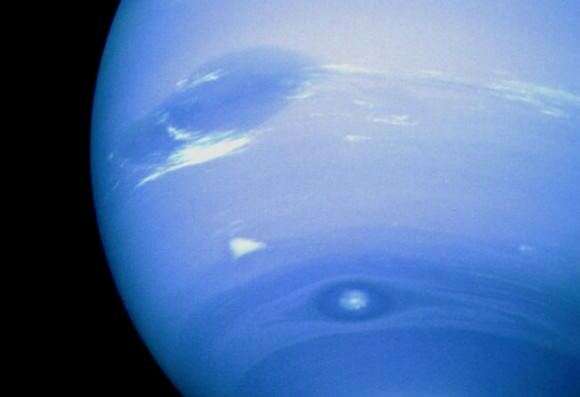 At one time, Neptune may have had a system of moons that were very much like those of Jupiter, Saturn, and Uranus. But since it is well-situated to pick up dwarf planet-sized objects that were kicked out of the Kuiper Belt, this changed. Looking to the future, Rufu and Canup indicate that additional studies are needed in order to shed light on Triton’s early evolution as a Neptunian satellite. Essentially, there are still unanswered questions concerning the effects the system of pre-existing satellites had on Triton, and how stable its irregular prograde satellites were. These findings were also presented by Dr, Rufu and Dr. Canup during the 48th Lunar and Planetary Science Conference, which took place in The Woodlands, Texas, this past March. Between the planets of the inner and outer Solar System, there are some stark differences. The planets that resides closer to the Sun are terrestrial (i.e. rocky) in nature, meaning that they are composed of silicate minerals and metals. Beyond the Asteroid Belt, however, the planets are predominantly composed of gases, and are much larger than their terrestrial peers. This is why astronomers use the term “gas giants” when referring to the planets of the outer Solar System. The more we’ve come to know about these four planets, the more we’ve come to understand that no two gas giants are exactly alike. In addition, ongoing studies of planets beyond our Solar System (aka. “extra-solar planets“) has shown that there are many types of gas giants that do not conform to Solar examples. So what exactly is a “gas giant”? By definition, a gas giant is a planet that is primarily composed of hydrogen and helium. The name was originally coined in 1952 by James Blish, a science fiction writer who used the term to refer to all giant planets. In truth, the term is something of a misnomer, since these elements largely take a liquid and solid form within a gas giant, as a result of the extreme pressure conditions that exist within the interior. What’s more, gas giants are also thought to have large concentrations of metal and silicate material in their cores. Nevertheless, the term has remained in popular usage for decades and refers to all planets – be they Solar or extra-solar in nature – that are composed mainly of gases. It is also in keeping with the practice of planetary scientists, who use a shorthand – i.e. “rock”, “gas”, and “ice” – to classify planets based on the most common element within them. Hence the difference between Jupiter and Saturn on the one and, and Uranus and Neptune on the other. Due to the high concentrations of volatiles (such as water, methane and ammonia) within the latter two – which planetary scientists classify as “ices” – these two giant planets are often called “ice giants”. But since they are composed mainly of hydrogen and helium, they are still considered gas giants alongside Jupiter and Saturn. Today, Gas giants are divided into five classes, based on the classification scheme proposed by David Sudarki (et al.) in a 2000 study. Titled “Albedo and Reflection Spectra of Extrasolar Giant Planets“, Sudarsky and his colleagues designated five different types of gas giant based on their appearances and albedo, and how this is affected by their respective distances from their star. Class I: Ammonia Clouds – this class applies to gas giants whose appearances are dominated by ammonia clouds, and which are found in the outer regions of a planetary system. In other words, it applies only to planets that are beyond the “Frost Line”, the distance in a solar nebula from the central protostar where volatile compounds – i.e. water, ammonia, methane, carbon dioxide, carbon monoxide – condense into solid ice grains. Class II: Water Clouds – this applies to planets that have average temperatures typically below 250 K (-23 °C; -9 °F), and are therefore too warm to form ammonia clouds. Instead, these gas giants have clouds that are formed from condensed water vapor. Since water is more reflective than ammonia, Class II gas giants have higher albedos. Class III: Cloudless – this class applies to gas giants that are generally warmer – 350 K (80 °C; 170 °F) to 800 K ( 530 °C; 980 °F) – and do not form cloud cover because they lack the necessary chemicals. These planets have low albedos since they do not reflect as much light into space. These bodies would also appear like clear blue globes because of the way methane in their atmospheres absorbs light (like Uranus and Neptune). Class IV: Alkali Metals – this class of planets experience temperatures in excess of 900 K (627 °C; 1160 °F), at which point Carbon Monoxide becomes the dominant carbon-carrying molecule in their atmospheres (rather than methane). The abundance of alkali metals also increases substantially, and cloud decks of silicates and metals form deep in their atmospheres. Planets belonging to Class IV and V are referred to as “Hot Jupiters”. Class V: Silicate Clouds – this applies to the hottest of gas giants, with temperatures above 1400 K (1100 °C; 2100 °F), or cooler planets with lower gravity than Jupiter. For these gas giants, the silicate and iron cloud decks are believed to be high up in the atmosphere. In the case of the former, such gas giants are likely to glow red from thermal radiation and reflected light. The study of exoplanets has also revealed a wealth of other types of gas giants that are more massive than the Solar counterparts (aka. Super-Jupiters) as well as many that are comparable in size. Other discoveries have been a fraction of the size of their solar counterparts, while some have been so massive that they are just shy of becoming a star. However, given their distance from Earth, their spectra and albedo have cannot always be accurately measured. As such, exoplanet-hunters tend to designate extra-solar gas giants based on their apparent sizes and distances from their stars. In the case of the former, they are often referred to as “Super-Jupiters”, Jupiter-sized, and Neptune-sized. To date, these types of exoplanet account for the majority of discoveries made by Kepler and other missions, since their larger sizes and greater distances from their stars makes them the easiest to detect. In terms of their respective distances from their sun, exoplanet-hunters divide extra-solar gas giants into two categories: “cold gas giants” and “hot Jupiters”. Typically, cold hydrogen-rich gas giants are more massive than Jupiter but less than about 1.6 Jupiter masses, and will only be slightly larger in volume than Jupiter. For masses above this, gravity will cause the planets to shrink. Exoplanet surveys have also turned up a class of planet known as “gas dwarfs”, which applies to hydrogen planets that are not as large as the gas giants of the Solar System. These stars have been observed to orbit close to their respective stars, causing them to lose atmospheric mass faster than planets that orbit at greater distances. For gas giants that occupy the mass range between 13 to 75-80 Jupiter masses, the term “brown dwarf” is used. This designation is reserved for the largest of planetary/substellar objects; in other words, objects that are incredibly large, but not quite massive enough to undergo nuclear fusion in their core and become a star. Below this range are sub-brown dwarfs, while anything above are known as the lightest red dwarf (M9 V) stars. Like all things astronomical in nature, gas giants are diverse, complex, and immensely fascinating. Between missions that seek to examine the gas giants of our Solar System directly to increasingly sophisticated surveys of distant planets, our knowledge of these mysterious objects continues to grow. And with that, so is our understanding of how star systems form and evolve. We have written many interesting articles about gas giants here at Universe Today. Here’s The Planet Jupiter, The Planet Saturn, The Planet Uranus, The Planet Neptune, What are the Jovian Planets?, What are the Outer Planets of the Solar System?, What’s Inside a Gas Giant?, and Which Planets Have Rings? For more information, check out NASA’s Solar System Exploration. Astronomy Cast also has some great episodes on the subject. Here’s Episode 56: Jupiter to get you started!